Amity Creek is a cold-water trout stream on the northeast side of Duluth, MN. The upper reaches of its watershed consist of thick glacial tills and glaciolacustrine deposits while the lower reaches flow over primarily bedrock before reaching Lake Superior. Its watershed is mostly undeveloped, but faces increasing development pressure due to its location leading to the scenic MN north shore. The creek was listed as Impaired (303(b)) in 2004 due to excess turbidity from suspended sediment, and fish-mercury. 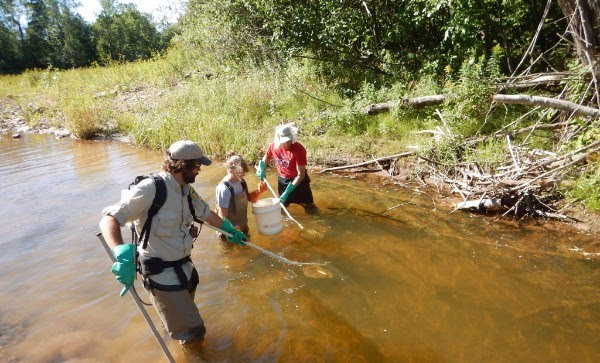 Since then, an effort has been made by multiple agencies, organizations, individuals, and UM-Duluth to determine the source and solution to the turbidity problem. South St. Louis Soil and Water Conservation District completed two projects to stabilize multiple banks along Amity Creek by re-grading steep slopes, planting trees and resizing culverts. More information can be found at the South St. Louis website here. Why focus on the Amity-Lester System? Click on the upper image at right for a slide show on site construction and what happened after the 2012 Solstice Storm. The channel is restored to a stable shape and slope, a large eroding bank is stabilized, and trout habitat is enhanced. Funding was provided by the MN Board of Soil and Water Resources 2012 Flood Recovery. This intermittent tributary discharged a muddy plume during rainstorms and snowmelt runoff since a 1946 flood destroyed the road. WSRI/LSS partner, City of Duluth carried out a restoration including new culverts, flow rerouting, bank slope reductions, and sediment stabilization. Click the image to the right for a slide show. This project is a continuation of the Weber Stream Restoration Initiative (WSRI). 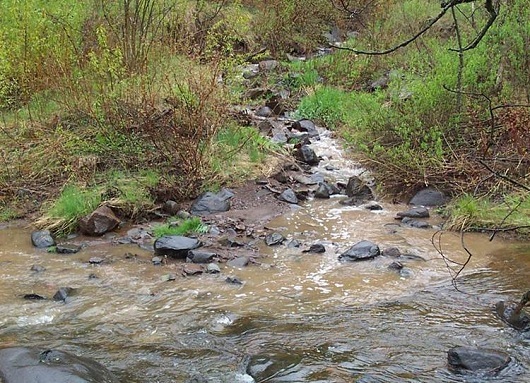 The Amity GLRI addresses: restoration of important tributary habitat for fish impaired by turbidity and/or temperature; assisting local governments in tributary restoration; and protecting near shore native fish communities by reducing sediment and nutrient loading. (1) bank stabilization and channel restoration of an intermittent tributary (Graves Rd Creek by the City of Duluth) to Amity fed largely by residential stormwater; (2) two bank stabilizations, riparian zone re-vegetation, and in-stream flow diversion (J-vanes) on an upper watershed reach (S. St. Louis County SWCD); and a neighborhood stormwater BMP retrofit project (NRRI + City of Duluth). The project is integrated with the Superior Regional Stormwater Protection Team (26 partner organizations) and LakeSuperiorStreams.org. Read more about it here (St Louis SWCD) or here (Veit). We know that planting trees along streams helps keep the water clean, but we don't know which trees are the best choices. Duluth's Amity Creek will be the site for a study to determine which species can withstand animal browsing, competition from other plants, and are most cost-effective. Volunteers will plant white spruce, white cedar, white pine and tamarack, which will be assigned animal–browsing restraints and weed control treatments. NRRI researchers will monitor the trees monthly to determine their success rates, along with the expense associated with each species and treatment. Read more here. UMD scientists, city utilities staff, and local environmental engineers have teamed up with homeowners in Lakeside to determine the best ways to reduce stormwater runoff from a Duluth residential neighborhood. Sections of Chester Creek were greatly impacted by the 500-year flood of 2012. Restoration efforts will begin in October 2017, and are concentrated in Chester Park. Plans include: removing two dams, re-aligning and reshaping the creek channel so its moves sediment effectively, planting hundreds of trees and bushes and creating trout habitat. A new pedestrian bridge will also be installed by the City of Duluth near the current site of the lower dam. Maintaining historic views, enhancing the natural beauty of the park, preserving the ski run-out area, and meeting the goals of the City's mini-master plan are all part of this exciting project. For more go to South St. Louis SWCD. The Lake Superior Zoo is experiencing sediment buildup in the pond above Grand Avenue which is an impoundment of Kingsbury Creek. In addition, portions of the rock and concrete walls along the stream are failing, preventing visitors from being able to interact with the stream. The dam is part of the culvert abutments at the Grand Avenue stream crossing. The Grand Avenue culvert is scheduled to be replaced by MNDOT in 2013. For more go to Lake Superior Coldwater Coalition. The Knife River is Minnesota's largest Lake Superior tributary with no natural barriers preventing fish migration, and contains wild steelhead trout and native brook trout populations. However, the Knife River is listed on the EPA's 303(d) list as impaired for turbidity. Since the listing of the Knife River in 2010, Lake County Soil and Water Conservation District (SWCD) and our project partners have successfully designed and implemented several projects aimed at reducing turbidity in the Knife River. One project was installed in 2011, with funding from the Clean Water Fund. One year later this project was tested during the June 2012 flood, and successfully protected the streambank with no slumping or major erosion. A second project was implemented in summer 2014 on the Knife River, also using the flood plain bench method (known as toe-wood). Here over 300 feet of streambank was stabilized. This project will decrease sediment to the river by approximately 140 tons per year. Funding for this 2014 project was provided by the Great Lakes Commission. Long-term impacts of all projects will be monitored through water quality (MN Pollution Control Agency) and fish populations (MN Department of Natural Resources). This watershed was converted from forest to grass during the development of the Spirit Mountain Recreation Area in the 1960s. The result was increased spring snow melt runoff from the ski hill. Efforts are underway to restore wetlands and reduce stream flows and sedimentation. For more go to Lake Superior Coldwater Coalition or the St. Louis River Estuary - Stories and Science Restoration page. A natural-bottomed trap was constructed in 2004 below the Miller Hill Mall complex. This involved widening and deepening a portion of the stream to slow stream flow allowing sediment to settle. Read more about restoration efforts in Miller Creek, including the Miller Hill Mall Stormwater Plan and the Re-meander project behind Kohl's, here. Banks were stabilized along Miller Creek near the intersections of Trinity and Anderson Roads, using tree roots, brush and soil, rather than riprap. Trees damaged by a large windstorm in 2016 were used for this project. Minnesota Pollution Control Agency has released Miller Creek Water Temperature Total Maximum Daily Load: A report to address impairment of aquatic life due to elevated stream temperature. Sections of Mission Creek were greatly impacted by the 500-year flood of 2012. Future restoration efforts, which are concentrated in upstream of the Fond du Lac neighborhood, plan to stabilize sections of the stream, promote trout habitat, and improve resilience for future flooding. For more go to South St. Louis SWCD. The summer of 2016 was dedicated to pre-restoration monitoring, including temperature, sediment and fisheries. The next phase in stream design. Sections of Sargent Creek were greatly impacted by the 500-year flood of 2012. Future restoration efforts, which are concentrated downstream of the Munger Trail, plan to stabilize sections of the stream, promote trout habitat, and mitigate sediment impacts. For more go to South St. Louis SWCD. The Stewart River is a state protected water and a designated Trout Stream. The Stewart River and its tributaries are a spawning ground for native brook trout and for steelhead. Historic logging increased run-off to the river causing erosion. Then the June 2012 flood caused the river to become very unstable, not allowing increased sediment or debris to move downstream. The instability of the channel has lead to increased sediment filling pools and embedding gravels causing reduced trout habitat, widening of the channel causing increased temperatures and high rates of streambank erosion. Restoration of the Stewart River will occur in summer 2015. Currently designs are being constructed with the guidance of Dave Rosgen, nationally recognized geomorphologist. Dave Rosgen and the LakeSWCD engineering team will use Natural Channel Design methodology to realign the stream channel, install grade control structures, reduce streambank erosion, and provide trout habitat. It is estimated that this project will reduce sediment input to the Stewart River by 551 tons per year. Along with the restoration, Dave Rosgen will teach a geomorphology/river restoration course to 40 local natural resource professionals. The lower St. Louis River (SLR) is one of 42 Areas of Concern (AOC) in the Lake Superior basin. An AOC is a site that has serious environmental pollution problems that require remedial action and the development of a Remedial Action Plan (RAP) to outline ways to restore the area. The Minnesota Pollution Control Agency and Wisconsin Department of Natural Resources offer up-to-date, on-line information about the system. A complete list of SLR contaminated sediment studies and their data is also maintained by the MPCA. The St Louis River Alliance is a local nonprofit organization that has worked since 1996 to foster communication between public and tribal agencies, industry groups and community stakeholders to help restore and protect the river. The Fond du Lac Band of the Lake Superior Chippewa has partnered with Minnesota, Wisconsin, and federal agencies to help develop and implement the restoration plan. The Lake Superior National Estuarine Research Reserve, lying within the AOC, was created in 2010 to improve the understanding of Lake Superior freshwater estuaries and coastal resources and to address the issues affecting them through an integrated program of research, education, outreach, and stewardship. Read more about the SLR Estuary's degradation and now restoration (exit). Nearly 1300 feet of trout habitat has been restored in this stream with funding from the Lessard-Sams Outdoor Heritage Council, MN Trout Unlimited, USDA Wildlife habitat Incentives Program, US Fish & Wildlife Service, MN DNR and Namebini. For more information and images of the project check out the Namebini or Trout Unlimited webpages, or watch this news report about the local efforts to improve habitat in the Sucker River. View a poster by Dr. Karen Gran exploring the effectiveness of large wood at maintaining deep pool habitats through the June 2012 Flood here. Behind Glen Avon Park, a reach of Tischer Creek is trapped in concrete. The concrete is removed, the channed is restored to a stable slope and shape, and trout habitat is improved. Duluth Township Land Use Internet Map Tool "Greenview App"
Greenview is an online mapping tool that provides a user-friendly front end to information needed by homeowners interested in remodeling, new construction, or simply reducing stormwater runoff from their properties. The application provides parcel-level information on the amount of impervious surface (e.g. driveways, patios, rooftops), forest cover, wetland and green space, along with soil and topographic information. By summarizing data at the parcel level, homeowners can determine how future construction will affect runoff, and how structures such as green roofs or rain gardens can be used to reduce stormwater runoff. Tailored to townships on Lake Superior's north shore, GreenView provides inputs to stormwater management programs developed by federal and state agencies. At the broad scale, it creates a file that can be read by the EPA's National Stormwater Calculator (NSC). The NSC is a generalized application that estimates the annual amounts of rainwater and runoff anywhere in the United States, and demonstrates how low impact development techniques, from rain barrels to green roofs, can reduce that runoff. It also provides data for the MN Pollution Control Agency's more specific Minimum Impact Design Standards (MIDS) calculator, which allows evaluation of networks of LID and water retention features. Find out about other ways to better plan and regulate stormwater runoff in the Toolkit Planning, Economic Aspects and Model Ordinance sections. TMDLs in Progress - What is a TMDL?